The Australian Kelpie, also known as the ‘Kelpie’ or ‘Barb’, is named after the mythological kelpie, a shape shifting horse from Celtic folklore. By some theories the Australian Kelpie is actually of British origin, descending from the Collies of Northern England. 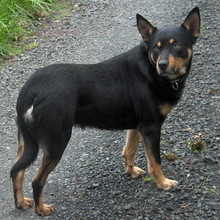 Others believe the Australian Kelpie descends from black Australian Collies bred with the Australian dingo. By the latter theory, owners of pet dingoes registered them as Australian Kelpies because dingo ownership was illegal, later crossing their dingoes with genuine Australian Kelpies. Some physical similarities and breeding records lend credence to this theory. In either case, the Australian Kelpie in its modern form began in Australia in the 1860’s, when ‘King’s Kelpie’ was bred widely after winning a major herding competition. The Australian Kelpie is an adept herding dog, able to work with sheep, cattle, and poultry. The Australian Kelpie is recognized by the American Kennel Club as of 2017. It is a fairly popular herding breed, particularly in its native Australia. The Australian Kelpie has a shoulder height of 17-20 in (43-51 cm) and weighs 25-45 lbs (11-20 kg). It has a long, narrow head, with pricked ears for show dogs. Australian Kelpies have a compact body with small feet and low-set tail. Show Australian Kelpies are shorter and heavier than working Australian Kelpies. The Australian Kelpie has a double coat consisting of a short, dense undercoat and hard, straight outer coat. The outer coat is weather-repellent. Working Australian Kelpies may be any color; many have a white chest. Show Australian Kelpies are solid black, red, fawn, chocolate, or blue. Black or red Australian Kelpies may have tan markings. Red Australian Kelpies with white face, chest, and feet are sometimes called ‘Red Cloud Kelpies’. The Australian Kelpie is an average shedder. The Australian Kelpie is a working dog at heart, full of energy and eager for a job to do. It is loyal and devoted to its family. It has a tendency to herd other dogs, pets, and animals in the house. The Australian Kelpie has an independent streak. This is not a dog to keep cooped up in the house all day; it will grow bored and destructive if unexercised or ignored. Australian Kelpies make excellent watch dogs, and can be trained as seeing-eye dogs. The Australian Kelpie is a working dog at heart, full of energy and eager for a job to do. It is loyal and devoted to its family. It has a tendency to herd other dogs, pets, and animals in the house. The Australian Kelpie has an independent streak. This is not a dog to keep cooped up in the house all day; it will grow bored and destructive if unexercised or ignored. Australian Kelpies make excellent watch dogs, and can be trained as seeing-eye dogs. The Australian Kelpie is good with children and other pets when raised with them from puppyhood. It is not an aggressive dog, but will defend its family and territory when necessary, even at the cost of its life. You can find Australian Kelpie puppies priced from $700 USD to $800 USD with one of our credible breeders. Browse through our breeder's listings and find your perfect puppy at the perfect price. The Australian Kelpie is good with children and other pets when raised with them from puppyhood. It is not an aggressive dog, but will defend its family and territory when necessary, even at the cost of its life. The Australian Kelpie is easy to groom; only an occasional combing and brushing is required. Bathe only when necessary. Australian Kelpies have a lifespan of 10-14 years. They have few health problems, but are susceptible to PRA (an eye disorder), hip dysplasia (malformed hip joint which can cause lameness or arthritis), cryptorchidism (undescended testis), and luxating patella (dislocated kneecap). The Australian Kelpie is very intelligent and easily trained. It is a natural herder. Australian Kelpies excel at competitive obedience events and dog agility, but also enjoy simple games of fetch. The Australian Kelpie is a working dog and demands a great deal of exercise. It is happiest when it has a job to do. It is not well suited for apartment life. Australian Kelpie Puppies for Sale - Shipped Worldwide! Finding the right Australian Kelpie puppy can be dog gone hard work. PuppyFind® provides a convenient and efficient means of selecting and purchasing the perfect Australian Kelpie puppy (or Australian Kelpie puppies) from the comfort of your home, 24 hours a day, 7 days a week. Take advantage of our PuppySearch or leisurely browse our directory of hundreds of dog breeds, Australian Kelpie dog breeders, Australian Kelpie dogs for adoption, and Australian Kelpie puppy for sale listings with photos and detailed descriptions. Some Australian Kelpie puppies for sale may be shipped Worldwide and include crate and veterinarian checkup. Many Australian Kelpie dog breeders with puppies for sale also offer a health guarantee. With thousands of Australian Kelpie puppies for sale and hundreds of Australian Kelpie dog breeders, you're sure to find the perfect Australian Kelpie puppy.